Four pools (A, B, C, D) will be composed of four teams each and in each pool the team will play a Round Robin system to determine the ranking and will be classified from 1st - 4th. The 1st and 2nd ranked team of each pool will move to Pool E and F and the 3rd and 4th ranked of each pool will move to Pool G and H.
Four pools (E, F, G, H) will be composed of four teams each and in each pool the teams will play a Round Robin system to determine the ranking. The 1st and 2nd ranked teams of Pool E and F will qualify for the semifinals. The 3rd and 4th ranked teams of Pool E and F will qualify for the play-off 5-8. The 1st and 2nd ranked teams of Pool G and H will qualify for the play-off 9-12. The 3rd and 4th ranked teams of Pool G and H will qualify for the play-off 13-16. The semifinals and play-offs consist of a total of eight matches: two semifinal matches for the rankings 1-4, two matches for the classification 5-8, two matches for the qualification 9-12 and two matches for the classification 13-16. - the winners of the semifinals will play the final for the 1st and 2nd position. - the losers of the semifinals will play for the 3rd and 4th position. - the winners of the play-off 5-8 will play for the 5th-6th position. - the losers of the play-off 5-8 will play for the 7th-8th position. - the winners of the play-off 9-12 will play for the 9th-10th position. - the losers of the play-off 9-12 will play for the 11th-12th position. - the winners of the play-off 13-16 will play for the 13th-14th position. - the losers of the play-off 13-16 will play for the 15th-16th position. 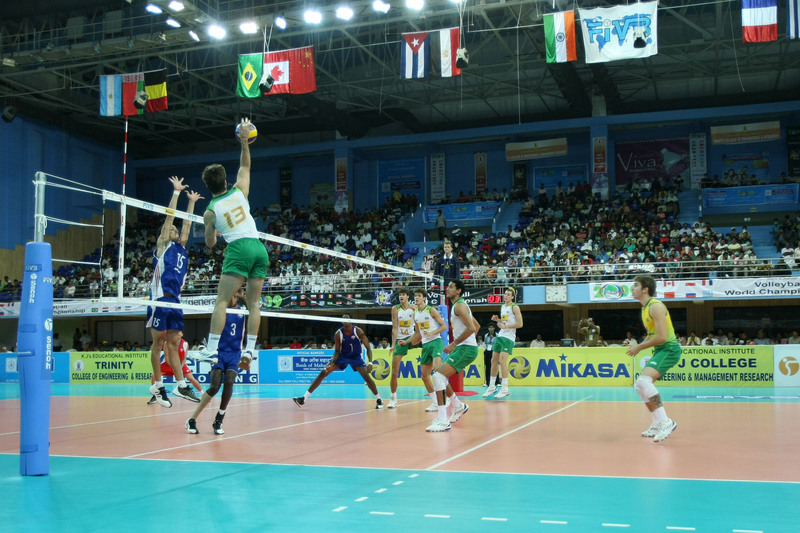 The organiser will be seeded as head of Pool A and the seven best teams according to the latest FIVB World Ranking, will be seeded following the serpentine system. Eight teams to be drawn according to Section I, Art. 7.2 of FIVB Sports Regulations. The organiser is awarded a vacancy from the continental allocation.